In this guide, learn how to reset network data usage in Windows 10, using administrative Command Prompt or via the Settings app. With the time, you’ll reach a stage when you may find that you need to reset network data usage in your Windows 10. Microsoft has implemented data usage reset settings in their OS, which will help you to perform this operation with ease. Resetting data usage will help you to periodically check how much your system is consuming network bandwidth. The data usage settings also show you the data consumption by apps. All these things will help you to plan your network usage, so that you’ve lesser burden on network billing. FYI: You must be signed in as administrator to reset network data usage. 1. 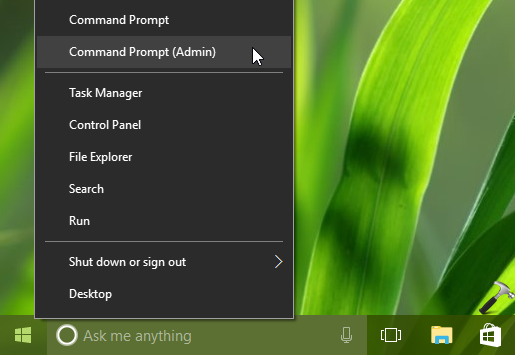 Right click on Start Button or press + X keys and select Command Prompt (Admin). DEL /F /S /Q /Q "%windir%\System32\sru\*"
3. Close Command Prompt. Your network data usage has been reset so far. 2. In the Settings app, navigate to Network & Internet > Data usage. Click on View usage per app or View usage details link. 3. Next, in the Usage details screen, select the connection type (WiFi/Ethernet) for which you want to erase data usage and click Reset usage stats. 4. In the confirmation prompt appearing then, simply hit the Reset button. The data usage should be erased immediately. You can close the Settings app now and return to the Desktop. Also read: How to reset network settings to default in Windows 10.